We've been working on making our own art for the baby's room. I think i'm done now, after making stuff for the last 3 months! Some projects were extra fun as J and i did them together - not something that we do often enough! 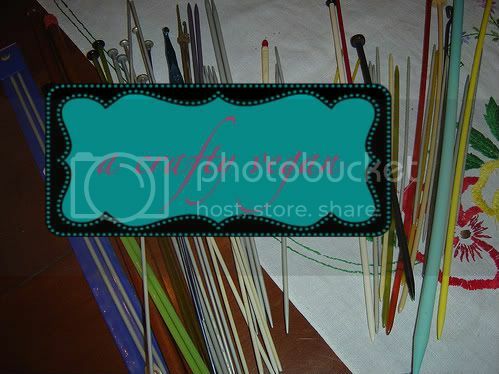 Here's a photo gallery for you to check out. I've posted some more photos on my Flickr page as well. Stay tuned for photos of the actual room too! Can you tell i have a bit of a theme? Wait till you see more photos of the room, but i am definitely going for a certain feel! 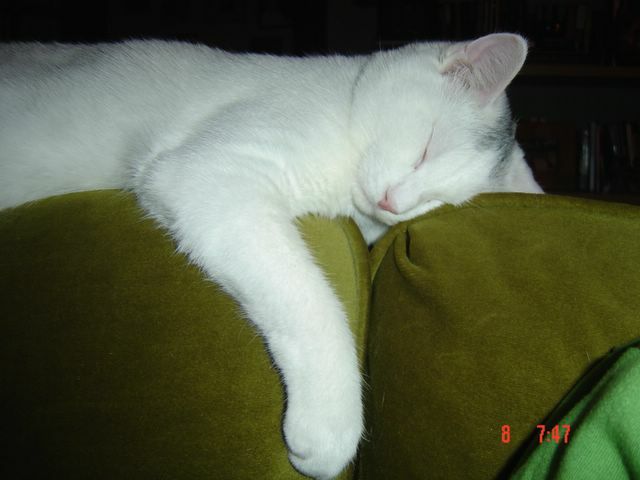 I found some of the projects in books and on-line and others we just created ourselves. 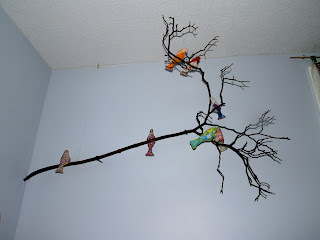 For instance, i'm sure you've seen the cloth birds around - they've definitely made their way around blogland! 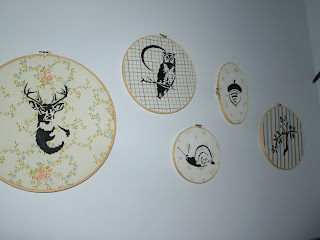 But, they are so simple and quick to make, so they make the perfect wall art/mobile! The green leaf pillow (of which i made 2 in different sizes) comes from Simple Gifts to Stitch - i just love that vibrant green. Thing i made from scratch - 1) the fun storybook blocks. 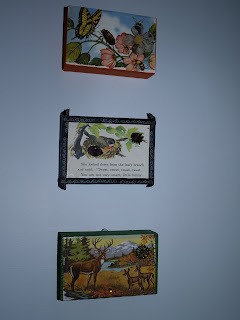 I found images (agan in the same theme) and modge podged them onto blocks of wood. I then added some fun details, to make a simple collage of sorts. To see the details, click here and here. 2) J also has been really into crafting these days, and is especially into screen work and stenciling. So, we decided to work together on making these lovely fabric art pieces, complete with the appropriate black and white art that newborns can actually see. We placed the 5 pieces above the crib, but as babe will be co-sleeping with us most of the time, this will be something to be enjoyed a bit later on. 3) J and i also collaborated on the birdhouse. Growing up, this was a project my parents did together, so it is only fitting that now J and i are - my dad would build the house and my mom would paint it in her folk art glory! 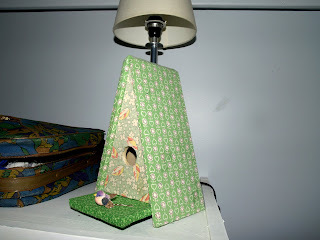 We changed it up a bit - J made an alpine-inspired house, and i decorated in some of my favourite vintage green fabrics. 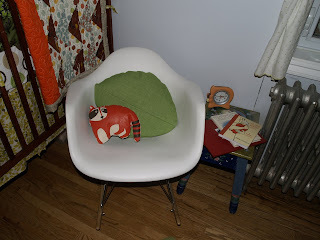 I guess you can call making crafts for the baby's room my take on this whole 'nesting' phase. I have 2 weeks to go today, and am very excited. The room and our home is pretty much ready, and i'm now focusing on preparing myself physically for the birth and mentally for the labour and what comes after! I love the crafts! They all look amazing - the baby will love the room. We too are taking the co-sleeping option...tomorrow is my due date!! Two weeks for you - how exciting. Best of luck with everything...I am going to sew me some birdies. Beautiful room! Love the doves! So cute :) I appreciate all the crafted items for baby room... Last one is my favorite! !